"Risk percentage based on Stop Loss." Fixed Fractional, also known as Fixed Percentage Risk is a popular money management strategy. 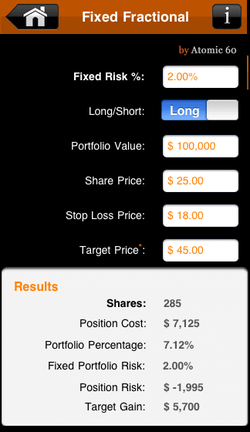 It looks at net risk, the difference between the Share Price and Stop Loss to calculate Positions Share Size.This money management system was made famous by Larry William and used by David P. Cash to win the 2001 World Cup Futures Competition. My Portfolio Value is $100,000. I want to set my Fixed Risk to 1.50% of my total portfolio value. Stock ABC is trading at $10.00. I want to go Long. I set my Stop Price at $9.00. Based on my Fixed Risk and Stop Loss, I can buy 1,500 shares. The cost is $15,000 which is 15% of my portfolio. My max loss is $1,500 or 1.50% of portfolio value.